Purchased from: N/A - given to me; thank you Karen G.
Today was Day #4 of Chocolate and Caramel Theme Week. World's Finest Chocolate (based in Chicago, IL) manufactures chocolate bars that are primarily sold to support fund-raising activities. 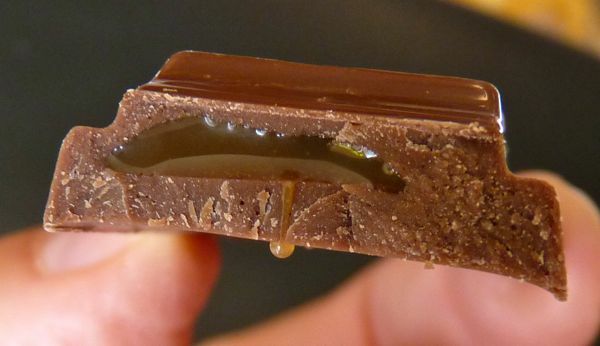 This particular milk chocolate bar, when broken into segments, displayed a nice thin layer of viscous caramel in the middle. The company mentions that they have an experimental cacao farm on the island of St. Lucia (in the Caribbean), and that they make chocolate from cacao beans. I would be interested in trying a bar with a higher cacao content -- so I can taste a bit more of the cacao bean flavor.